Quickstep Palazzo is wood in all it's glory. 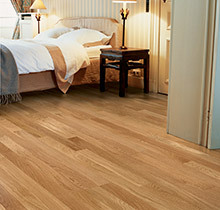 These beatuifully proportioned, long and wide planks will add warmth and character to any room. All designs have a subtle V-joint on the longest side of each plank. Each wood plank has a subtle joint on the longest edge to give more depth to the room. Whichever interior style you choose, the wide assortment of wood species, structures and finishes allow you to create an inviting atmosphere. 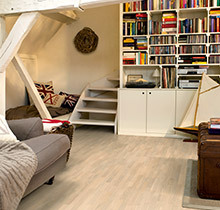 The vivid wood planks of the Quick-Step Villa collection will bring your room to life. The Villa series now also includes new 3-strip patterns with longer strips which makes the floor softer and less marked. This results in even more elegance, giving your room added length and depth. These vivid wood planks will bring your rooms to life. Enjoy the shapes and beauty of the wood within a harmonious frame.